Arvato Systems and T2 Computing Sign North American Partnership Agreement | Arvato Systems | IT Strategy. Solutions. Innovation. Headquartered in New York City, T2 Computing manages broadcast and film post-production for global media companies and independent post production facilities. 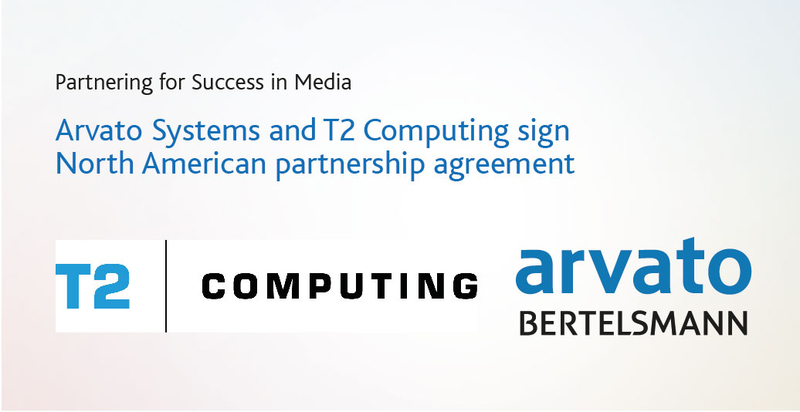 Known across the industry for their experience and talent in the media workflow space, T2 Computing is already involved in learning about the Arvato Systems product portfolio and are planning promotional activities and sales presence in the US market. The Arvato Systems portfolio to be promoted by T2 Computing includes the flagship VPMS Media Asset Management system along with the award-winning collaborative editing tool EditMate and the ClipJOCKEY studio production toolset. Together, these solutions present a compelling suite of products for North American media companies, offering a high level of integrated functionality that enables more streamlined workflows and improved operations– from both a financial and a creative point of view. Arvato Systems is thrilled to be working closely with T2 Computing, an organization that has an excellent track record and drive to succeed. We look forward to combining their expertise with our portfolio of solutions. “Arvato Systems is thrilled to be working closely with T2 Computing, an organization that has an excellent track record and drive to succeed. We look forward to combining their expertise with our portfolio of solutions.” comments Rob Fox, Vice President, Media – North America. T2 Computing is a unique IT solutions company that resolves a vast range of challenges leading companies face today. Through our highly experienced client team, the company provides the latest in computing, storage, networking and media hardware and software coupled with world-class professional services. We specify, design, deploy and support solutions for the most complex workflows. For more information visit www.t2computing.com.